Even though I've now lived in Brixham, a historic fishing town in South Devon, for nearly 9 months, I still haven't managed to explore the area in great detail. Not for lack of trying of course, but no one warned me how much rain Devon gets! So when the sun decided to creep out a couple of weeks ago, I couldn't resist getting out into the sun and taking my camera for a jolly in the countryside. 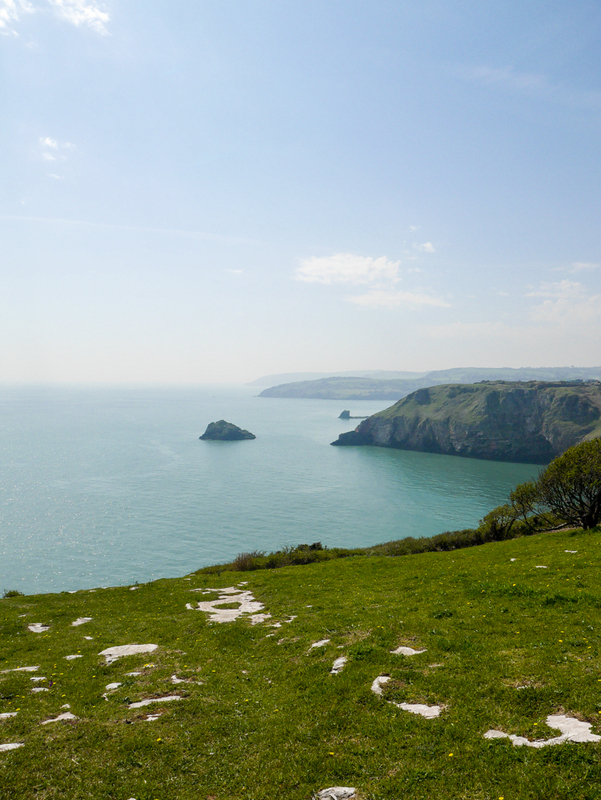 From my house, it's easier to walk to Berry Head by going past the Landscove Holiday Village which gives you a nice dose of countryside before you get to the epic views. As I got further up the cliff I realised that despite the beautiful sunny day, it was quite hazy in the sky so I'd probably miss out on seeing anything at a distance. That was fine though as there was a lot of nature to see and admire. I was surprised at how busy it was at the top as it's still quite quiet in the town, but it was nice to see lots of families out and enjoying the beautiful weather! Though you would think I was up there on my own judging by my pictures. At the top of the cliff, there's a lovely place to grab some food and drink called The Guardhouse Cafe. They serve hot and cold food, lots of yummy drinks and ice creams. I'd show you a photo of the homemade raspberry and white chocolate layer cake and mocha frappe, but unfortunately I inhaled them before I thought of that. Just take my word for it that it was GOOD. I seem to have a thing for lonely benches. So after that goodness, I headed back down the cliff through the woods towards the harbour. Walking through woods with the sun shining brightly through trees is one of my favourite things in the world and it was made even better by there not being many people around. After the woods, I saw the Shoalstone Outdoor Pool for the first time since moving to Devon. We missed this at the tail end of last summer, so me and my mum are looking forward to giving this a try once it opens for the season (26th May, for those wondering). Shoalstone is one of the last remaining sea water pools in the country and has been popular since Victorian times! Once the lighthouse on the breakwater came into view, I knew I was nearly back into town. Walking along that strip of rock is another thing I really need to tick off my list! Hard to beat the views on the edge of the harbour if you love cute rows of houses - which I most definitely do. I've not painted this side as yet, but this picture is definitely making me want to break out my watercolours! If you're interested in the other side of the harbour, I have a print available in my Etsy Shop! Hope you liked this mini photo diary. I'm hoping to add more as I find time (and good weather) to explore my new home town and surrounding areas!